Baron Mordo is a Marvel villain who specializes in black magic. He is one of Doctor Strange's primary antagonists. Baron Mordo will appear in the movie Doctor Strange and be played by actor Chiwetel Ejiofor. Chiwetel Ejiofor is best known for the lead role in the critically acclaimed 12 years a Slave. Baron Mordo is the former apprentice of the Ancient One who trained Doctor Strange. When Strange foiled Mordo's plot to kill the Ancient One he became Strange's bitter enemy. After his murderous intentions are revealed Mordo is exiled from the Ancient One. Doctor Strange is trained in his place. As both men received training from the Ancient One they have similar powers. 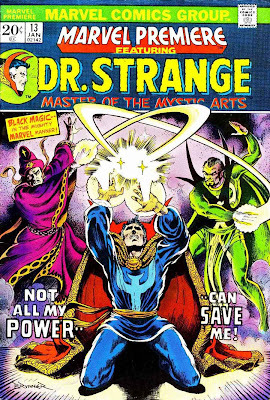 Doctor Strange is far more powerful that Mordo in magic, and Strange also has a variety of powerful magical items from the Ancient One. Mordo is not without his own advantages over Doctor Strange. Due to Mordo's amoral nature he is willing to dabble in black magic and demonology, which are sets of magic that Strange is typically unwilling to use. Mordo also seems superior in the arts of astral projection, hypnosis and mesmerism. While the dark magik's evoked by Mordo can give him an advantage, they also often back fire and are his undoing. Mordo battles Strange throughout his career. First he tries to kills and steal secrets from the Ancient One. He then tries to sabotage Strange's apprenticeship. He even tries to steal Strange's body when the later is left in his astral form. All of Mordo's plots fail. With little hope of beating Strange with his own power, Mordo seeks the aid of the evil entity of Dormammu who greatly enhances his power. At one point he joins with Dormammu's sister Umar to become the leader of the Dark Dimension. Dormammu returns however and wrests control back from the pair. Baron Mordo will appear in the movie Doctor Strange and be played by actor Chiwetel Ejiofor. Chiwetel Ejiofor is best known for the lead role in the critically acclaimed 12 years a Slave. It is thought that he will be altered and be in some ways an amalgamation of various Doctor Strange characters. During D23 Chiwetel Ejiofor was asked a few questions about Doctor Strange by Entertainment Weekly.